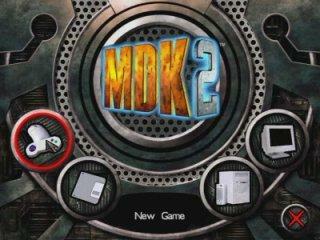 Released in March 2000, MDK2 features three styles of gameplay, depending on which character you're playing. The gameplay ranges from typical shooting action with Max, a six-legged dog, to puzzle solving with Dr. Hawkins. The story continues from where the first game left off. Kurt, Max, and Dr. Hawkins don't even have time to celebrate their victory over alien invaders as a new alien menace starts to take over Earth. Best time, PC version: Easy 1:24:48 by Andres 'Mad Andy' Montalbetti on 2006-11-09, done in 49 segments appended to one file. Speedrunning MDK2 was an idea which came to my head once reading a few threads on SDA about the game. For those that don't know, MDK 2 is the sequel to MDK (duh) and it takes place right where MDK finished. You play as Kurt from the first game, Max which is a 6 legged robotic dog, and Dr. Hawkins, a mad/funny scientist. Kurt's levels are based on stealth and sniper puzzles (like in the first game), Max's levels are based on picking up guns and destroying everything in sight, and the Doc's levels are based on puzzles. Easy and straight forward level. It went rather well overall. Maybe I could've been a little faster in a few spots but it's definitely passable. This level is pretty straight forward too. I was able to pick up the necessary ammo without stopping, and the boss went down pretty quick with 4 UZIs. Overall good. Level 3 (Dr. Hawkins) - What is the BFB?! Apart from the rather hilarious toast easting at the beginning it was quite good. It could've been a bit faster in the lounge part, but it's very random, so I just stuck with an above average attempt. The boss went down quite fast too, even if I missed him 3 times, but considering it's hard to hit him, and getting to that stage requires a lot of luck, I stuck with that attempt. Originally I tried to avoid the fat aliens and their homing in laser thingies. I realised that it was more like something you'd expect to find in a TAS, so instead I picked up the sniper shield right at the start and absorbed the hits with it. It serves as some kind of invincibility. Overall it was pretty smooth, and the boss was also taken out rather quickly. Level 5 (Max) - Dog Eat Dog! This level went pretty good overall. Unfortunately lengthy due to the platforms room and the generator room, but apart from that it was quick. The boss was also killed quite well by using 4 Gatling guns. First of all, note that there's a small inconsistency. At the beginning, on the way to the lounge, you may notice that there's a segment change, and before the fadeout I had the atomic toaster equipped, and after I don't. This was unfortunately because once i figured out you could hit the buttons with the atomic toasts I redid the first bomb in about 30 seconds faster, but when I figured it out I was already at the 3rd bomb, and before I didn't have the toaster equipped, so this small inconsistency showed up. I originally went through the level to see how pressing the bomb buttons worked, and if they were pre-set. That was the case for the 1st bomb, but all the others were random. Now, instead of following the game's lead and press the switches in a specific random order, I manipulated luck and pressed the switches in the order that I wanted to press them. This meant that I needed to use quite a lot of segments. The boss was also totally random, but he could be killed by using the plutonium Kermit gives you previously in this level. Overall it was quite good, even though doing this level took me forever. The lockball puzzles and the green headed robots in this level almost made me hate Kurt and his segment of the game =P Overall it went quite well, and the boss was taken out before he managed to disappear under the huge platform. This level was pretty straight forward and easy too. A bit tricky in a few spots and overall a long level. It went quite well overall. Figuring out the best character was a big challenge of this level. However, considering max has the fastest pre-boss and fastest/easiest boss, that's who I went with. There were 2 parts to the boss, the outside and the inside. The goal of the outside was to get the game to generate 2 ray guns (being the most powerful weapons) around the arena and pick up the atomic jetpack while shooting Balloobba. The inside on the other hand had the goal to destroy all the organs within 1 cycle. I managed to do so, and it was overall quite good.